A large number of bright, flexible offices over 4 floors of a modern, high tech building. This centre presents both open-plan and private space with use of meeting rooms and car parking. 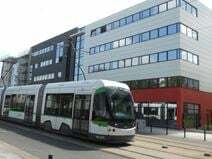 It is just minutes’ from the TGV station, an easy distance from Nantes Atlantiques airport and is conveniently situated within the business area of the city, opposite the Cite des Congres. It is just 10 minutes away from the beautiful Château des ducs de Bretagne. A contemporary, single storey property which presents a large number of flexible office spaces with excellent natural light. Offices are furnished and fully serviced with use of meeting rooms, a welcoming reception area and ample car parking. The site has good motorway links and is a short distance by car from central Nantes and the centre is surrounded by a complex of quality hotels and restaurants. Many international companies have a base in this area. Located on Ile de Nantes in the heart of the business district, this business centre is spread over a space of 1,000m² providing 40 fully furnished offices, workstations and meeting rooms that can cater for up to 25 people. You will also have copy and printing facilities to use at your disposal, IT support to keep your operations running efficiently, and company signage options to give your company a strategic presence throughout your occupancy. Within the centre's immediate area, there is a beautifully maintained park in which to relax during your breaks. This centre sits within an illustrious new development with an emphasis on enviromental sustainability. Offering an impressive range of amenities including on-site dining, roof terrraces and a garden exclusively for client use, these quality serviced offices are sure to benefit your business. Superb local and national transport connections abound, with trams, buses and the TGV nearby (offering connections to major French cities and beyond). This fantastic business centre comes fully furnished at less than 1 hour from the Atlantic Ocean, ideally located in the Nantes Technoparc. There are 28 secured offices and secured parking with 24/7 access you can work in complete serenity and at your own pace. This centre is ideal for networking since there is an abundance of other businesses on site. The space is surrounded by many shops, eateries and more. Tenants of this business centre situated in the heart of Nantes have access to a meeting room suitable for up to 8-12 people and a range of 30 serviced offices from 10 to 25m² suitable for single workstations up to several people. There is a range of support services available, and a number of facilities to use at your disposal. There is copy/printing facilities, meeting rooms and conference facilities, high-speed internet and more. The surrounding area offers lots of transport links, and this highly commutable space is close to several local amenities. The business centre is located in Place du Commerce, right in the heart of the city. All amenities, great restaurants, welcoming cafes, lively bars and quality shops are less than a 2-minute walk away. The space is modern and accessible 24/7, and there are 3 meeting rooms available to use on site. There is also IT support available to help your company work as efficiently as possible. The space also offers easy access to public transport, making commutes quick and simple. Within close proximity of this space, there are lots of cafes, bars, restaurants and shops to explore and enjoy. This centre is accessible 24-hours a day, with support services available, from adminstrative/IT support to reception services. With mail handling and telephone answering, your business can work efficiently. There is also copy/printing facilities, company signage options, onsite parking and high-speed shared internet to use at your disposal. With easy access to local transport, bars and the Vertigo Jardin, and right next to the Natural History Museum, this beautiful mansion in downtown Nantes provides fully serviced co-working office space. Here, you can enjoy a full range of services, such as 24 hour access and security, allowing you to work late hours with peace of mind. In addition, there are videoconferencing facilities and IT support on-site so you can stay well connected to international clients.